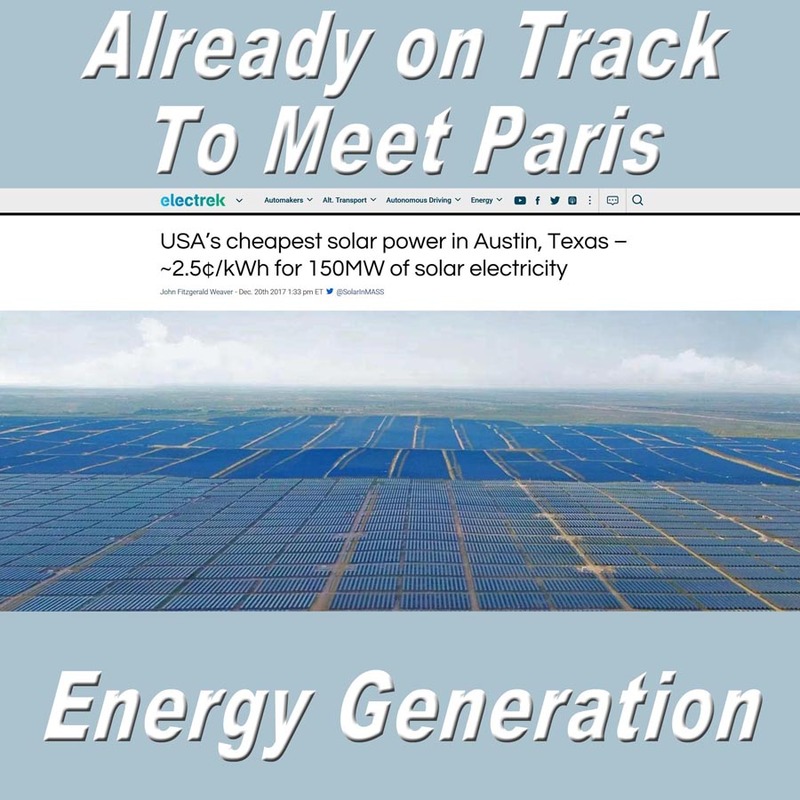 Are We Really On Track To Meet Paris Energy Generation Commitments Without Carbon Regulations? Naam, Smaller, cheaper, faster: Does Moore’s law apply to solar cells?, Scientific American, March 16, 2011. Click for link. Paris commitments are generally about 80 percent emissions reductions by 2050 and net zero, or 100 percent emissions reductions by 2080. Because of the dramatic fall in costs of alternative energy construction, one could validly say that today we are virtually on track to meet Paris’ energy generation emissions reductions commitments. New energy generation construction with technologies other than wind or solar, in most cases, is simply too expensive to be economically feasible. The astonishing recent drop in solar prices is a primary indicator of why we are now so surprisingly on the best-case scenario path of emissions reductions from energy generation. In 2009, the cost of solar photovoltaic at the utility scale was $0.26 per kilowatt hour (kWh.) 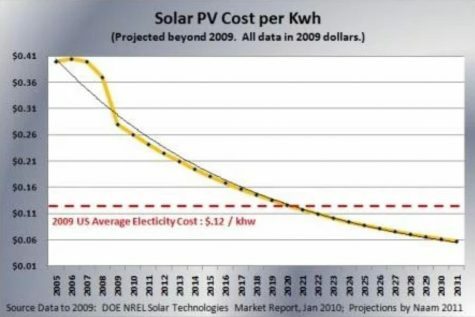 The 2009 projected cost of solar in 2017 was $0.16 kWh. But today, because of increased manufacturing capacity and demand, the lowest cost globally is $0.0179 kWh. The projected price was supposed to fall by 38 percent by 2017, but instead it has fallen by a mind boggling 93 percent. We expect $10.2 trillion to be invested in new power generation capacity worldwide to 2040. Of this, 72% goes to renewables, or $7.4 trillion. Solar takes $2.8 trillion and wind $3.3 trillion. Investment in renewable energy increases to around $400 billion per year by 2040, a 2-3% average annual increase. Investment in wind grows faster than solar – wind increasing 3.4% and solar 2.3% per year on average. Although the world’s power sector emissions reach a peak within a decade, the rate of decline in emissions is not nearly enough for the climate. A further $5.3 trillion investment in 3.9TW of zero-carbon capacity will be needed place the power sector on a 2°C trajectory. By 2040 then, we have $5.3 trillion in alternative energy generation spending that remains to meet Paris commitments of 80 percent emissions reductions (from energy generation.) If we spend $7.4 trillion by 2040 like Bloomberg suggests, we are 60 percent of the way to reaching Paris’ goal. If we continue building at the same linear rate as between now and 2040, we reach 80 percent reduction by 2054. 1) The above assumes a linear rate of alternative energy generation construction. The rate however, will not be linear. Bloomberg undoubtedly includes this nonlinearity in their work, but the simple assumptions here do not. 2) Alternative energy costs reductions have greatly surprised us all. How likely is it that this curve advancement will continue? This analysis only looks at energy generation. Our greenhouse gas emissions come from more than just energy generation with about 25 percent coming from energy generation. That said, We are virtually on track to meet Paris’ 2 C goal for emissions reductions from energy generation — without serious CO2 emissions regulations. The projected date of meeting 80 percent by 2054 that we have made here understates because we consider a linear reduction rate. Because the rate most certainly increases over time, it is entirely feasible that we will meet 80 percent by 2050 instead of 2054. This is fundamental to climate culture psychology. The fears of our climate culture are largely based on our 30-year attempt at doing something impossibly difficult, that penalizes us all immensely, just to meet 2 C. This load is now lifted and it’s happening organically, without our regulatory intervention except for incentives for alternative energy(!). What does this mean for the future? How do we adapt our current climate culture to address other areas of greenhouse gas emissions? And how do we incorporate this exciting development into the most important aspect of climate reform — reducing the accumulated load of climate pollutants already in our sky?